On Friday, 9th November, we were very happy to welcome Bishop Philip to our church, to ordain Brother Andrew to the diaconate. The liturgy was the mass for the feast of the Dedication of the Lateran Basilica. A goodly number of parishioners turned out on what was a very rainy evening, in order to support Br Andrew as he made his commitment to the Lord’s service as a deacon, the final step before his priestly ordination, which we hope will take place in the summer next year. John and Alison Wagstaff were present, having travelled up from Cornwall. There were representatives from other Oratorian communities: Fr Ignatius Harrison, Provost of the Birmingham Oratory, from which congregation, Br Andrew came to us; Fr Daniel Seward, provost of the Oxford Oratory and Fr Richard Duffield with Br Henry O’Connell for the York Oratory (in formation). There were also priests form the Local Pastoral area and further afield in the diocese, and other friends of the new deacon. 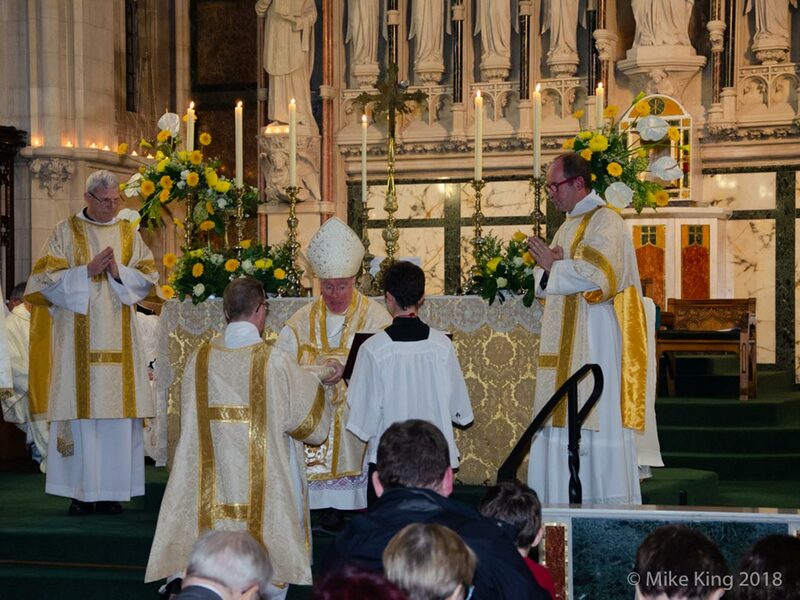 Our own Deacon Roger, together with Deacon Barry form Charminster, assisted the bishop and helped clothe Brother with the Dalmatic, welcoming him into the order of deacons. We were very happy ( not to say, relieved) that Fr John Chandler, one of the diocesan MC’s, came and oversaw the ceremonies, which he did with great calmness. The Fathers would like to thank all those whose contribution helped make the occasion so beautiful: the choir,organist,servers, florists, bell ringers, welcomers and all those who laid on that magnificent spread afterwards. Thank you all. We will, please God, do it all over again when Brother will be ordained to the priesthood. Details to follow. Watch this space.